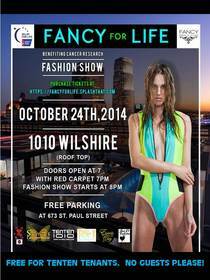 LOS ANGELES, CA--(Marketwired - Oct 28, 2014) - Fancy For Life is an event that benefits cancer research. The event is partnered with Relay for Life and The American Cancer Society. All proceeds from the event will go towards fighting cancer. In addition to helping fight the battle against cancer, you'll be able to witness a world-class fashion show. This event will be held on October 24th, 2014 at TenTen Wilshire, located in Downtown LA. In case you haven't heard, TenTen Wilshire's live/work situation consists of Fully Furnished Apartments, Executive Office Space, as well as Fully Furnished Offices. While we encourage you to check out what all they have to offer, please know that the event will take place on the rooftop of TenTen Wilshire. The views will be beautiful! The doors will open at 7pm, and we encourage you to take part in our red carpet event. Doors will open at 7pm and the event will start promptly at 8pm. Please note that there will be free parking conveniently located at 673 St. Paul Street. We are excited to announce this event as we bring awareness to cancer research. What better way to close out LA's fashion week than with our very own fashion show! Without the help of caring individuals, we wouldn't be able to work towards furthering cancer research. This event allows individuals to have fun while working towards a wonderful cause! We highly encourage you to bring a guest (or two!) to enjoy this wonderful fashion show. It will be one-of-a-kind. An event that you surely won't want to miss! Already have plans for this night? Don't worry! You can visit our website at http://www.fancyforlife.splashthat.com to donate directly to the event. While we highly encourage your presence, our main goal is to give meaning to what this night is really about. Thank you for taking the time to learn a bit about our charitable event. We hope to see you at TenTen Wilshire on October 24, 2014 at 8pm.